Share a little smile with everyone you meet! And bring a little bit of Heaven into your life! Doreen Virtue is one of my favorite authors. She is a clairvoyant of the Angels. I borrowed this message below from her, and I hope she does not mind. 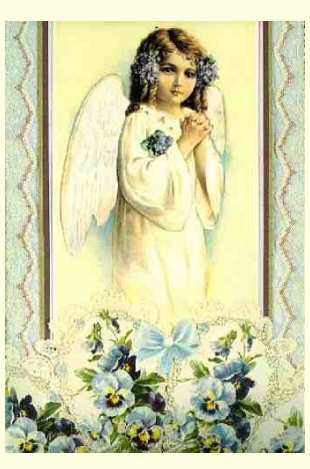 If you click on the picture of the Angel, it will take you to her site called Angel Therapy. This site will tell you about her and also give you names of books that she has written. I just through reading, "Healing with the Fairies." I highly recommend it. Excellent reading material. God is everywhere. God is peace. Therefore, peace is everywhere, in truth. Right now, your nerves may feel frayed, and you may notice that you and other people are jumpy or irritable. These are normal reactions to times of great stress. Following hurricanes and intense illnesses, for example, it's common for families members to fight, and people to engage in addictive behaviors. Please don't forget your powerful spiritual resources at this time. The roar which cries for revenge and war can overshadow the quieter, but more powerful voice, of Divine Love. Why would God allow such an event to occur? God is one-hundred percent Love, and cannot know anything but Love. All attack comes from the ego, which is not of God. If we focus on attack in any way, our egos become engaged. And that makes us feel all of the ego-feelings: fear, anger, and doubt. A psychotherapist named Phyllis Crystal was on an airplane which sat on a tarmac in the middle east, many years ago. Suddenly, three armed men stood up to hijack the plane. Phyllis prayed for help, and she suddenly received a very strong and intense influx of love. Phyllis was guided to send that love to the hijackers. The moment that she did this, one hijacker "accidentally" cut himself with his knife. He hurt himself so badly, that he got angry and flustered. The hijackers then ran off the plane, calling off the hijacking entirely. We, too, can love the "hell" out of people who seem to attack us. We only make the situation more dire by holding divisive "Us-versus-Them" thoughts. We may never be able to forgive their actions, but we CAN forgive the people involved, to heal the situation. Remember that the Course in Miracles says that there is no order of difficulty in miracles, and one miracle isn't harder or larger than another. We CAN spiritually heal this situation, and transform a situation of suffering and fear, into one of peace and unity, IF we use our power of thought to affirm that truth. First, we must surrender the situation to the Divine wisdom of our Creator. The Mind of God is so creative, and already has a solution. Second, we must remind ourselves that God is everywhere, even within the terrorists. As easy as it is to write them off as subhuman, they ARE holy children of God, just like you and me. The more we know this truth, the more difficult it will be for them to act in un-Godly ways. Remember: we are loving the "hell" out of them. Third, focus your mind on peace. Affirm peace in all ways. Refuse to affirm the illusion of chaos. Wherever there is chaos, God is not there -- and THAT would be impossible. Chaos and danger are nightmares from a mind that is asleep to the spiritual truth of God's omnipresent Love. Let us awaken from the nightmare and see the truth, so that we can live in a world of Divine love and peace. The angels have told me that those who perished in the explosions and crashes want their deaths to be a testament to the importance of peace. They don't want us to "avenge their deaths with hatred or attack." While we all understand the need to take action to prevent a reoccurrence of September 11th's tragedies, there are overtones of a bloodthirsty need for revenge, that we must avert. The ego's need for revenge will put us on a course of chaos and fear! We must elevate our consciousness above the cries and rallies for war. Let the renewed patriotic spirit stand for "One Nation Under God," not for "One Nation Bent on Revenge." The former comes from our higher self; the latter comes from the ego. Which type of world do we want? "Dear God, Thank you for your eternal peace, within my own self, and within each person and animal upon this planet. We are so grateful for Your angels, which hover even closer to us right now. We know that we are made in Your image and likeness, so we are ALL filled with love, peace, and Divine wisdom at all times. We stay centered in that truth, and see a world that is peaceful. Since God is all that is, and God is entirely peaceful, there is nothing BUT peace in our world." 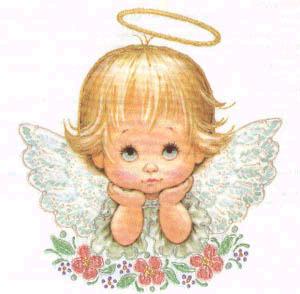 Here is a page to put different things about Angels. Some things that some of our Angels would like to share with us all. And stands right at your side. To see when you've lost sight? And makes you feel happy? That you didn't have a care? As they guide you along your way! And inspire you to succeed. About life and the hereafter. And bring you joy and laughter! Clicking on the picture below will take you to an incredible posty shoppe. About the powers of love. I wish you to understand. God gave you to share. Donna Kinniburgh is a Deep Trance Medium who works in the style of Edgar Cayce with her husband Steve who acts as her director/conductor for these sessions. For 16 years Donna has channeled a large grouping of Spiritual entities who call themselves "REFLECTION", Donna and Steve have worked with and trained Deep Trance Mediums for over 20 years. More articles by Donna Kinniburgh read here at SpiritWeb. Indeed, Your human race has spoken of angels or angelic forces through eons of your existence. Artists have, indeed, painted pictures that would include images supporting wings, that which some call halos, if ye will. These images be depicted through your religious bodies. Now where did these thought forms and images derive from, what are they and, indeed, do they exist? Let us first begin by stating, indeed, angels do exist! And this is not, firstly, to become confused with that which is referred to as your spiritual guides. For the spiritual guides are not in the same role as angels and angels be not in the role of spiritual guides . Indeed, in the beginning of your time, humanity, in its primitive state of being, did witness many different forms of unknown phenomena. For these beings of the human nature did see that of space craft landings, and interacted with such beings of light that would glow and would also have the ability to rise and descend onto the earth appearing as if to levitate or to fly. And as, at that time in your world, religion had been newly introduced to the uneducated populace of the period, indeed, artists began to encapsulate the form of the being resembling the humanoid with wings, as it appeared to fly, and with a halo as it appeared to glow, and referred to same angels as messengers from God descending from the sky or heavens. Now, moving forward into, indeed, the actuality of angels and their role from the spiritual point of view, not to compare this with the artistic rendering of same. Indeed, which be extraterrestrial in origin, yet the angelic force that does exist be those that would be connected to the Blessed Devine energy that some refer to God/Goddess or any other such term to denote the supreme wisdom and intelligence. Angels are those essences that have not experienced and would not experience physical reality. Indeed, for it be the spiritual guides that have had multiple lifetimes of physical interaction, yet the angels in reality be the guidance of your spiritual guides. Some individuals have experienced visitations in the dream state by angels, and because they have been taught or programmed to reference angels by the artistic renderings, would automatically accept these visions with the wings and halos as their comfort zones and reference, indeed, by the data that exists in the unconscious mind, which be the layer of learned belief. Not the subconscious mind, mind you, but the unconsconscious. Angels have a purpose, which be to give clear direction of the spiritual realm to assist your spiritual guides in delivering to yourselves, of the physical, a complete picture, or as complete as one can perceive, of the understanding of the spiritual realm. And in turn, your spiritual guides can bring perception to the angelic format of the physical reality. For as they, the angels, have not experienced the material world, indeed, it would bring them further completion as to their own being-ness. These are energies that interact, not only with your planet earth, but these would have the connection to other races in other life forms, to understand, support and blend the totality of the universe and universes, indeed, on each physical reference of life and also on the conceptual. These beings would give direction and clarity to that which many are seeking for at this time on the so-called various dimensions of existence. Indeed, at this time they would give individuals, both your spiritual guides and yourself, opportunity to comprehend the fourth dimension. And as your world evolves into a thought form of non-judgment and unconditional love there will be a new opening to the perception to what ye call the 5th, 6th and/or the 7th dimensions. Now through your reference of time, this would take much effort and change. For humankind, indeed, has a requirement to maintain and develop the group consciousness of which is the platform for the angelic force to communicate in. Some schools of thought have a requirement to name these angels as if they be an army. There would be a reference to the Arch Angel that some refer to as Michael; there would be the reference to Rafael, Gabriel and a myriad of other names. This action be the need for the human element to label and place into boxes so that they can dissect and understand and ye, in fact control that which be not containable. The Angels do not have the need for names or levels. They would provide service or energy, in unison, without these conditions, in agreement and with pure love without limits or conditions. Yet there are certain roles that would be provided. Indeed, the one-angelic force that has the greatest connection to the material, the physical reality, would be form that ye have labeled Michael . This be only in reference to the understanding of the physical that we use this name. This being shall we state for lack of another term in your language, as this be not of a physical form, would exist in etheric energy yet would keep record of all physical conditions of life. This being is likened to a record keeper. At this point in your time continuum, we are prepared for further queries. SK: Yes, I have a couple based on what you have said and a few others. So the difference between spiritual guides and angels is that basically angels are the guides to the spiritual guides. SK: Do they ever at any time connect directly with us and if so why would they do that? RE: Indeed, they would. They would connect with individuals when there is intense change in the life. Now this intense change could be when one deciding to leave the physical, hence you have heard of many individuals who may, on the deathbeds, be having these visions and/or the near death experiences. There may be a direct change to help one overcome an illness. When there is a sudden awareness of the spirit. Take, as an example, an entity that has never considered any faith choice. One who may have considered them self as an atheist suddenly have a spiritual awakening would have an occurrence of this angelic force. SK: Now would this be through their guides or directly from what you call angels? RE: This always connected, you see. The spiritual guides would prepare the physical being for such visitation of the angels. SK: Over millennium but more specifically over the last 20 or 30 years a lot of channelings are depicted as being directly from a specific angel or arc angel. Could you comment on that please? RE: Indeed, this would be dependent upon the need of the receptor. For there would be a need, again, to label . This is a very important point, here. The spirit does not require naming or labeling, tis more for validation on the part of the channeler. If the channeler feels secure with the presence of a particular named angelic force that would allow them to be more receptive to the energies and open the channeling talent to allow the energy to flow and hence would accept a name as a reference. SK: Could this then indicate that it is really their guides, possibly connecting with that angel energy but without a direct connection? SK: There has been some discussion about whether there are male or female angels; most are depicted as males. Are there females? RE: Gender does not exist in the spiritual realm. This only applicable to your humanoid reality. Now to put it a clearer here, these energy forms are directly linked to that of what some call the Godhead or what we call the Blessed Divinity. 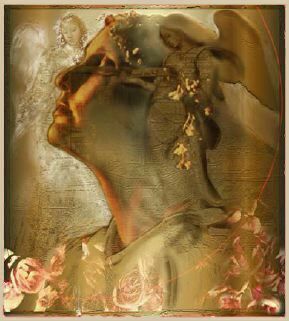 The Devine does not hold gender for Devine is the duality of the masculine/feminine energy that creates and as the angels be the messengers of the Devine would, indeed, neither hold gender. 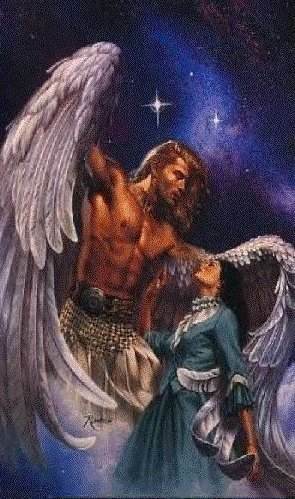 Take note that in the original artistic renderings of angels that this be during a male dominant society that held the power and as angels be seen as all empowerment by their unknown perceived abilities, then the visions captured and delivered through word of mouth be that of male, ye see. Your race hath a need to separate. SK: So that is their purpose. They are the messengers between the God force, the God/Goddess energy or the Blessed Devine as you call it, to the spiritual guides, which then impart that energy to the individual on Earth. RE: Indeed, ye see the spiritual guides have familiarity with you because of the other realities that ye have shared and existed together in. SK: So would they use the form of angels to communicate with us because it is such a strong aspect of the Christian belief? SK: Can angels manifest themselves into the physical as depicted in the bible statement such as an angel of the lord appeared to them or spoke to them, is this in fact a reality? RE: That angel of the lord , in reality was extraterrestrial beings that would be perceived as angels because of the unfamiliarity of energy or auric field that would glow and because of the ability to transcend and descend due to particular travel devices that were used. It be an interpretation by a culture that did not have the understanding of technology; a young and primitive culture, and they would hide their face, for the light was bright as in radiation, which they describe as a halo and the notion, indeed, of wings were used to justify the flying. Some of the extraterrestrial beings did also wear suits with a type of helmet with a fluid to enable them to adapt to your atmosphere and bearing backpacks to also resemble wings. These also would be determined by the culture at this time of your history to come from the heavens. SK: There has been a tremendous upsurge of popularity in angels over the last 10 15 years. What is the reason for that, and could you define to us why it is occurring? RE: In a global sense, and this is not to include all beings of your world, masses of individuals are moving towards the Christ or Christos consciousness, the collective bond. In order to do this there be a requirement for stepping stones. As angels be most familiar in your world and as angels, through many parts of your wheel turns, have been present; are in artistic rendering; in your churches; at your Christian celebrations, which are supported in the western world by your media and communicative structures, indeed, and as children enjoy angels, this brings about feelings of security. This perception be a stepping-stone to spiritual enlightenment for it would be acceptable to the conscious mind of many. For humanity have a requirement to hang on to the known element or learned patterns. Therefore, the Guardian Angel comes into play as the known element that connects individuals to God so that they do not feel alone. SK: Does everyone have a guardian angel? RE: If one does term this to be a guardian angel, then this is the belief, which becomes the reality. 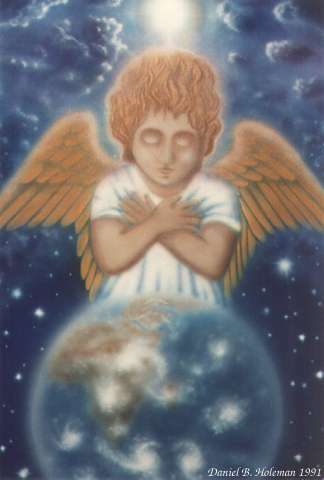 Each individual does have their own angelic format in his or her energy field. This not an individual entity as ye know this to be, ye see. For that would imply a person that be holding the humanistic ego state. It be an etheric energy form, though it would take, in the mind of the person, the form of an individual to bring comfort and acceptance of the presence because of your race s need to view that which can be seen and be identifiable and as one would require a definitive vision since ye be trained to see in black and white. SK: Is there anything more you would like to say about our spiritual guides and angels? RE: Indeed, Angels teach the spiritual guides of the broadness of spirituality. Spiritual guides offer information of the physical reality so that these angels can expand their knowledge of the material and deliver to other life forms, information of your existence. They be communicators and messengers and would as your spiritual guides, be concerned of present day beings on the planet you are on and the life you be living; angels are, indeed, concerned with the beings of all in all planets or star systems, all life forms, alternate life forms, other dimensions and so on and so on into infinity. And be aware that as your soul hath experienced a multitude of lifetimes in many realms of the physical and other types of existence, which do include those other planets, and systems, then consider that those angels have guided the guides that ye have had within those realities as well which may or may not be the same guides that ye are familiar with in the present day life. SK: I would like to use an analogy to possibly be described as a metaphor, in the series Babylon 5, a certain race called the "Vorlons" which is called the older race , the first ones they were called. When one was viewed by the many different races on B5 being both alien races and humans, each one saw this being as an angelic type of being but with a different name and a different identity to their own race, yet it was one being. Could this be the same way we view angels and other aliens would view the angelic energy or beings. RE: Indeed, that is exactly correct! SK: Thank you, your parting comments then, please, on Angels. RE: Indeed, angels are amongst ye. If you are alive they are with you, if one chooses not to be alive, they are with you. It is that force that cradles you when you are feeling ill. It is that force that encourages you when, indeed, you feel at a loss. It is that force that carries you, indeed, when you have not the will to carry yourself. 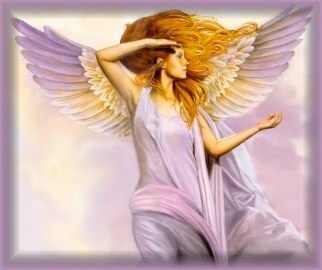 Indeed, angels are light forms and it is this energy that is used in healing, in empowerment and this energy that works with your own personal spiritual guides. For these guides are concerned with your life spirit, the angels are concerned with your soul. Your spirit and your soul, indeed, are not the same. The spirit is part of the soul, yet the soul is beyond your conception. The spirit empowers your physical reality; the soul encompasses all of your various spirits in different realms of existence. Angels, no matter what, indeed, the depiction or the rendering be, exist in your heart. And the more you feel love the more ye empower the angelic self to be one with your spirit. And becoming one with the whole is the reason why you exist for in so doing there would be universal harmony. The uni meaning one; verse , meaning song this one song is the voice of a choir of angels singing in harmony .the uni-verse or uni-verses. And we do state onto you, do go in peace, and remember, ye are never, ever alone, indeed not, for ye are at all times, in all ways at one with the Blessed Devine. And we do thank thee for your energy, blessed be! Also consider to read more articles by the same author. Beloved's, the key word for you now is Transition. For that is your current state--you have and are moving through--bravely and yet unsure--hopeful and yet with some doubt--brightly through the darkness. You are succeeding in staying the course of your soul's urgings. You are allowing the old contracts to dissolve and the new life to take root. Now you are transitioning. The walk of life has shown itself to be rocky, and filled with thorns as well as sudden avalanches of water. The deepest human despair is felt and endured. And through all of the turmoil, you are finding your own sense of balance and sure footed-ness. Yes, it feels slippery, and you can't quite see the path for the fog has not yet entirely cleared. But oh, what sweet fragrance is that, that is drifting into your heart now --can you name it? Dream with me for a moment--while you read, allow your inner vision to create these words-give them your own meaning. You exist as a spark of light and energy and you are travelling through the universe. You pass many planets and recognize some as home. Your flight is guided by a path of streaming particles of sound and essence like a magic carpet. You inhale the colors and your heart is filled with its pure existence of BEING-NESS. You are traveling to a destination from the farthest edges of the galaxy--you have no idea where this stream is carrying you, and yet you have no cares or concerns. Your every moment is filled to capacity with the sights and sounds of the flight. Your faith is the very root that connects you to the current .You are the stream and the stream is you---flowing, dipping, circling, endlessly, passionately, loving the Oneness that just is. You are now in the Milky way, following the stream, and the light around you becomes brighter and brighter, and it engulfs you entirely--to the outer eye it appears to be an explosion---but to MY eyes, it is you right now reading these words. You, as light and form and energy are bridging the human experience by embodying your radiance from one millisecond to the next. You have chosen to continue to create and live, bravely and so, so brazenly. Every day that you choose to BE, unleashes and opens more of your own light codes, within the matrix that is your Divine Blueprint for your earth life--your job, your mission, your expression of the gifts that you bring to the world. Hold the faith- know that Transition has its own course, its perfect speed and will not fail you or anyone else. This calendar time that you are living has its own life, its own perfection and it trusts you to travel with it, not against it. In a few months of your time, by May, and June, your footing will feel much more secure. I, Metatron am flowing within you as the current of light that makes up your very soul. And I am having the ride of all time as I live within the magic carpet that is each one of you. Thank you for staying the course--thank you for Being. Thank you, for by your faith and perseverance, your willingness to live through both doubt and absolute knowing, your ability to be vulnerable within strength, and your expressions of complete bewilderment mixed with tears of love, you are actively manifesting the Template that is Adamic Man. I come with these words today to bring support and affirmation to each one. You do exist as human and you do exist as a true son/daughter of God-- of Light. The next time you observe a flame, consider its many purposes, as it exists within the brightness of its natural illumination. You will be seeing yourself.